I learn a lot about my personal style and fashion inklings through blogging as I get to externalize, summarize, and evaluate the streams of fashion obsessed consciousness that flutter through my mind. One thing I've noticed is I don't wear black ensembles. Like at all. I think it's because I view black as a basic look and somewhat of a fallback option so I always end up choosing another color. But I believe it's time to black out my blackout as I'm come to realize the versatility and dramatic appeal of black on black outfits. 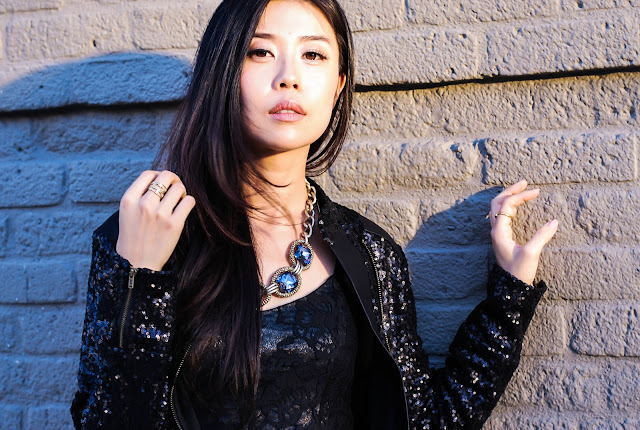 A black lace dress and a fabulously sequined black jacket kind of epitomize cool holiday dressing. I love the unexpected pairing of glitzy sequins against a romantic lacy backdrop. Together, they elevate the everyday color to an interesting and unique style place. The Lucca Couture lace dress can be worn up or down. Layer it with a blazer for a office chic look during the day and switch it out for the Lucca Couture sequined jacket at night for all the fabulously glamorous holiday parties. A bejeweled crystal necklace from Leslie Danzis, a simple metallic belt, and my favorite fall pumps from Shoedazzle complete the party perfect all-black look. Lucca Couture selected me as their blogger of the month which means I got to select, curate and caption my LC November favorites. I love hands-on blogger/brand collaborations as they stimulate and encourage my creative juices to flow instead of just going with the flow. I hope you like my selections! i love the lace and the sparkles! Absolutely adore all the sequins! Beautiful necklace! what a sassy holiday look! Love the mix of lace, sequins, and metallic! love everything! Especially the shoes! I love the outfit, you looks very good!!! you have a great style and natural beauty! I am SO in love with how glamorous you look! adore this look! I would rock it in an instant! Oh my, this looks fabulous !!! Wonderfully crisp and always interesting! I'll brows more to get new dresses.